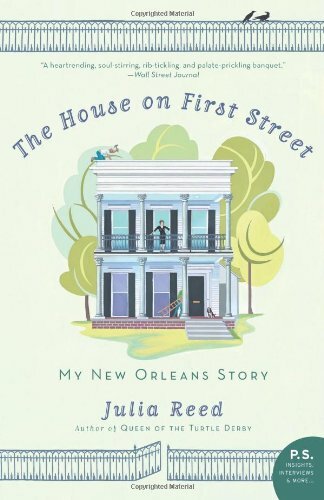 Julia Reed’s The House on First Street: My New Orleans Story may be her memoir of the renovation of the home she buys (across the street from Anne Rice’s old place) with her husband, after many years of living in tiny, funky New Orleans rentals, and not quite cutting ties with New York, but it’s also a love story about old houses and old cities, and the magic that both offer, if you only know how to feel it. While this book, with it’s comical (to those of us who are merely reading about it) and familiar (to any of us have gone through it) tales of slow, less-than-adequate contractors, dusty floors, paint disasters, plumbing woes and the search for the perfect appliances, fixtures (everything from the most charming door knob for an inside door, to debates about porcelain – should they use Toto toilets or some other brand? ), rugs, and furniture is essentially about the relatively common practice of restoring a vintage home, it’s also a first-hand account of the aftermath of Katrina. The hurricane struck, you see, just two weeks after Reed and her husband had finally moved into the House on First Street. They were lucky – they lost an expensive tree, and had some minor exterior damage – but their neighborhood didn’t flood. Nevertheless, Reed was in position to be in the city sooner than most of the other residents, and while she shares humorous anecdotes about buying barbecue for an entire platoon of National Guards, underlying the wry tone is the poignance of a woman who just wants to go home. Review: The House on First Street by Melissa Bartell is licensed under a Creative Commons Attribution-NonCommercial-ShareAlike 4.0 International License.